When you walk into Mason Chiropractic & Wellness Center, you’ll feel relaxed immediately by our quiet, Zen-like environment. 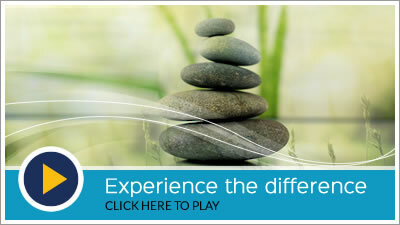 We invite you to enjoy this calm, peaceful feeling before seeing you promptly for your appointment. The nervous system scans are taken with the Insight Millennium Subluxation Station™. This technology measures and assesses the function of your nervous system, which controls and regulates everything in the body. It controls the way we think, move, even how we digest food and how the immune system works. By showing you this information, you’ll see the level at which your body is functioning. We’ll monitor your condition by doing scans at regular intervals so that you can see how you’ve improved, measuring your nervous system integrity to understand your level of health. On your next appointment, Dr. Mason will go over a report of his findings and X-rays if you had them taken. We’ll use different models to show you how the spine degenerates and what a proper spine looks like and how it functions. We’ll go more in-depth on what we discussed on your first visit, discussing the body’s self-healing abilities and how chiropractic addresses interferences in your nervous system that trigger pain or dysfunction. You’ll get Dr. Mason’s recommendations for a care plan. If you choose to begin, you’ll receive your first adjustment. This selection of short videos will help you learn more about chiropractic care and staying healthy. Regular visits will go more quickly than your first two. Most people get an adjustment and are done while others might also get electric muscle stimulation, ultrasound or some form of muscle therapy. There’s a common misconception that you have to see a chiropractor for the rest of your life once you start. You don’t have to do anything you don’t want to. It’s like going to the dentist regularly for checkups. The frequency of your visits is higher at the start of care because we’re retraining spinal mechanics, joints, ligaments and tendons. After your body starts to realign, you’ll see us less often for maintenance care. Most people maintain their health by seeing us once a month. You’ll learn a great deal about health and chiropractic on your first visits with us, and we’ll continue your education during your following appointments. We believe that educating you is the best way to help you take control of your well-being. Dr. Mason holds a radio program once a month on a variety of topics, such as chiropractic, nutrition, functional medicine, heavy metal toxicity and food allergy or sensitivity. Dr. Mason also offers health talks at the Mocha House restaurant downtown that you’re welcome to attend. Get started on better health today. On-site X-rays and same-day appointments available! Contact our practice by email or phone.